Finance Minister Matia Kasaija on Friday told parliamentary Committee –COSASE, investigating the closure of commercial banks in Uganda that city tycoon and proprietor of Crane Bank told him late 2016 that he was no longer interested in his bank. “When the Governor Bank of Uganda brought to my attention of the problem Crane Bank had, I rang Sudhir. I said ‘ Sudhir Ruparelia, I don’t want your bank to go under. If he was here he would testify. Because, when it goes under, it reflects very poorly on the economy.” Kasaijja told COSASE chaired by Hon. Katuntu. He added: Bank of Uganda says your bank is undercapitalized to the tune of Ugx. 400bn, I know you own some properties in town, would you mind to sell off some of those properties and revive your bank? The minister told the Katuntu committee that the response he got from the city mogul was negative. This week, dfcu bank officials told COSASE, that Crane Bank directors and shareholders owed their own bank 63 billion and had not paid by the time the bank was closed. According to Bank of Uganda, Sudhir owned 28.83% of shares in Crane Bank. Other shares were held by White Sappire Limited (47.33%) a company incorporated in Mauritius, allegedly owned by Kantaria. Another 4% of shares were owned by Litendra Sngahari and another 19.83% owned by members of Sudhir’s immediate family-wife and o3 children. Bank of Uganda claims, Sudhir was actual owner of Crane Bank. 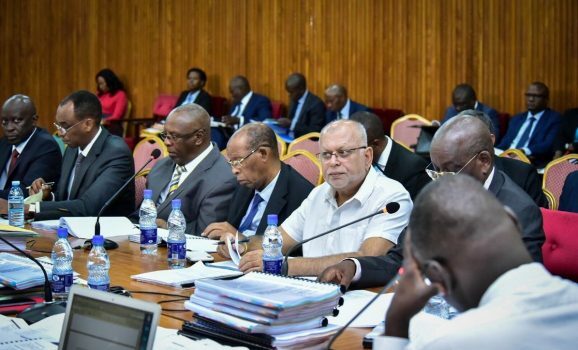 Documents presented by dfcu officials also revealed that Crane Bank had poor credit monitoring standards illustrated by an unclear relationship management model, lack of call reports and no proactive project management. “In a way, by letting the Bank collapse and not diverting capital from his other businesses, the first winner in the resolution of the Crane Bank transaction is Sudhir.” Said Kitamirike. At the time of closure of Crane Bank, the Bank’s net asset position was negative meaning that the liabilities far exceeded the assets (Ugx. 589) billion as at 20 December 2016). The bank had also faced significant liquidity challenges during the course of 2016 and had obtained liquidity support from BoU in excess of Shs 350 billion.